Below is a list of recommended books (with sources) to read if you are just beginning your studies of what America is and what has made America great. “These beliefs have made possible more progress in 200 years than was made previously in over 5,000 years. Thus the title “The 5,000 Year Leap”. The Making of America provides a wealth of material on the Founding Father’s intentions when drafting the American Constitution. It is one of the most thorough compilations of statements by the Framers relating to constitutional interpretation, and addresses the Constitution clause by clause — providing resources on the Founder’s intent of each clause. The National Center for Constitutional Studies, a nonprofit educational foundation, was created in order to revive those original American concepts in all of their initial brilliance and vitality. The study for The Making of America extended over a period of nearly 40 years, and an organized effort to present this information in a published text was a concerted endeavor of nearly 14 years.It will be observed that many new insights are provided in the writings of the Founders for the solution to serious economic, political and social problems plaguing the world today. At four o’clock in the morning on a Sunday in November 1956, the city of Budapest was awakened by the shattering sound of Russian tanks tearing the city apart. The Hungarian revolution — five brief, glorious days of freedom that had yielded a glimpse at a different kind of future — was over. But there was a bridge at Andau, on the Austrian border, and if a Hungarian could reach that bridge, he was nearly free. It was about the most inconsequential bridge in Europe, but by an accident of history it became, for a few flaming weeks, one of the most important bridges in the world, for across its unsteady planks fled the soul of a nation. 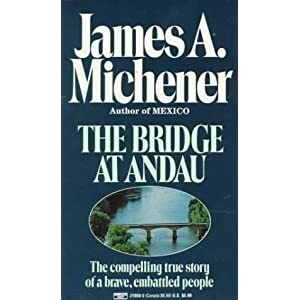 Here is James A. Michener at his most gripping, with a historic account of a people in desperate revolt, a true story as searing and unforgettable as any of his bestselling works of fiction. The story of three generations in twentieth-century China, it is an engrossing record of Mao’s impact on China, an unusual window on the female experience in the modern world, and an inspiring tale of courage and love. Jung Chang describes the life of her grandmother, a warlord’s concubine; her mother’s struggles as a young idealistic Communist; and her parents’ experience as members of the Communist elite and their ordeal during the Cultural Revolution. Chang was a Red Guard briefly at the age of fourteen, then worked as a peasant, a “barefoot doctor,” a steelworker, and an electrician. As the story of each generation unfolds, Chang captures in gripping, moving — and ultimately uplifting — detail the cycles of violent drama visited on her own family and millions of others caught in the whirlwind of history. Originally penned in 1912, this historical reprint showcases individual portraits of the fiercely courageous women who endured tremendous hardship as their husbands fought to build an independent nation. women such as Abigail Adams, Dorothy Quincy Hancock, and Julia Stockton Rush contributed their wisdom,strength, and loyalty to the cause of the Revolution, shaping history a a result.